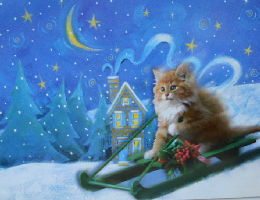 This kitten is sliding down the hill with holiday wishes. Inside greeting: Couldn't let Christmas slide by without saying "Hi"! This Christmas card is 7" wide x 5 1/4" high. Each package contains 10 cards and 10 envelopes.